Four scouts from Chester Boy Scout Troop 139 have earned the rank of Eagle by completing projects that have made improvements to Chester’s parks and trails. Congratulations to James Gause, Chase Mantione, Brian Testa, and Collin Testa. Chase’s Eagle Project involved remarking the Cattle Tunnel Trail and clearing out the tunnel itself. Due to natural weathering, the tunnel had filled with silt and water while the trail had become entirely overgrown. The project cleared out the tunnel, creating a path of stepping stones for hikers to navigate the water-filled tunnel with ease, while also marking and clearing the surrounding trails that led to the tunnel. This was in an effort to not only make the trail more easily accessible, but also to connect the Luce property and Tiger Brook Park, two major hiking properties in Chester. 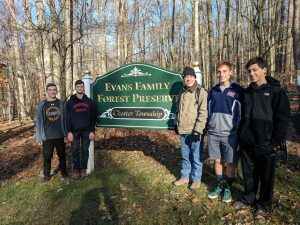 James’ Eagle Scout Project was to blaze and open up the trails in the Evans Family Forest Preserve in Chester Township. He and his fellow scouts drilled holes in hundreds of trail markers and systematically attached them to trees in appropriate locations throughout the park. They also cleared overgrown trails to make them passable. James worked with town officials to make sure that a revised trail map reflected the trails accurately. The finished product included a red, white, blue, and yellow trail as well as an updated online trail map. Collin’s Eagle Scout Project improved the Evans Family Preserve in Chester. This project was chosen because Collin is an avid hiker who frequently walks the trail systems. The project improved the trail by building eighty feet of puncheons (elevated boardwalk) over a muddy section in the trail that will prevent erosion and keep hikers out of the mud. The project also provided seating along a stream by building a picnic table and a bench. Brian’s Eagle Scout project involved construction of a fire pit in the MacGregor Field camping preserve in Chester, New Jersey. The project involved identifying a suitable location in the camping area, clearing the area and digging holes for the pit and benches. The fire pit and benches were installed and included a locking grate on top of the pit to ensure only permit holders were able to use it. This provides the campgrounds of MacGregor Fields with a safe and secure way to conduct fires, while simultaneously conserving the area. A great job by all four scouts!